The great mother goddess of ancient Egypt, Isis was the sister and wife of the god Osiris*. Together these two deities played a major role in many stories in Egyptian mythology, particularly in myths about rebirth and resurrection. The cult of Isis became very popular in Egypt and eventually spread to other parts of the Mediterranean world, including ancient Greece and Rome. 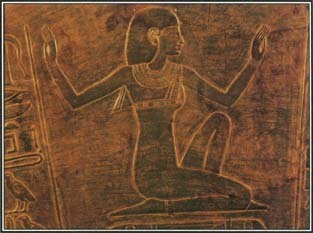 According to Egyptian mythology, Isis was the daughter of the earth god Geb and the sky goddess Nut. Her sister and brothers were Nephthys, Set, and Osiris. These six deities—Geb, Nut, Isis, Osiris, Set, and Nephthys—belonged to an important group of nine Egyptian gods called the Great Ennead of Heliopolis. The cult of Isis, the mother goddess of ancient Egypt, spread to many parts of the Mediterranean world, including Greece and Rome. One famous myth about Isis tells how she discovered the secret name of the sun god Ra and increased her power. According to the story, Isis found Ra asleep one day, snoring loudly and saliva dripping from his mouth. She collected the saliva and mixed it with earth to form a poisonous serpent. Then she placed the serpent on a path that Ra took every day. When Ra awoke and started on his way, the serpent bit him, causing terrible pain. He called to the other gods for help, but all were helpless except Isis, who promised to cure him if he revealed his secret name. At first Ra refused, but eventually the pain became unbearable. He told Isis the name, and she gained new powers. This story was associated with a major aspect of Isis's character, her skill in magical arts. One of the most important myths associated with Isis was the story of Osiris's death and resurrection. According to this tale, the god Set became jealous of his brother Osiris, who ruled as king of Egypt. One day Set tricked Osiris and sealed him inside a box. Set then placed the box adrift on the Nile River, which carried it to the distant land of Byblos. Isis searched for and found the box and then brought it back to Egypt, where she concealed it. However, Set discovered the hiding place and cut Osiris's body into many pieces and scattered them throughout Egypt. After recovering the pieces, Isis used her magical powers to restore life to Osiris, who then went to live in the underworld. Sometime before this happened, Osiris and Isis had had a son named Horus. Isis kept the child hidden from Set so that he could grow up and avenge his father's death. She protected Horus against all dangers, even restoring him to life once after he was bitten by a scorpion. When Horus became a young man, he fought his uncle Set. But Isis took pity on Set and allowed him to escape. Angry at his mother, Horus cut off her head. Thoth, the god of magic and wisdom, changed the severed head into a cow's head and reattached it to Isis's body. Some ancient statues and paintings of the goddess show her with a cow's head, and she is often linked to the goddess Hathor. Eventually, Isis went to live with Osiris in the underworld. The ancient Egyptians regarded Isis as a perfect mother, and she was worshiped as a protector goddess because of the way she sheltered Horus from danger. In the roles of mother and magician, she also cured the sick and restored the dead to life. As the mother of Horus, who took his father's place on the throne of Egypt, Isis also was thought to play a key role in the succession of Egyptian kings. See also Afterlife ; Egyptian Mythology ; Horus ; Osiris ; RΑ (RE) ; Set ; Underworld . I find it very interesting that mythology and Muslim are connected with 'Isis'. The muslim women also pray to the Lady Fatima of the Catholics. Muslims and Catholics seem to have a lot in common.